It has been a very long time since I’ve last posted. My apologies! Much has happened since I posted my last entry at the end of March. I just celebrated eight months with a special person, I graduated from law school, and I took the California bar exam. I am also back in DC, despite my previous plans of going back home to Los Angeles. It’s a tough market for would-be lawyers. I am working part-time at the Office of Student Affairs at the law school, and supplementing that income with wages from moving boxes and delivering wine for Ansonia Wines on Saturdays. Needless to say, with law school loans coming due and the expenses of living on my own mounting, I have very little money leftover for purchasing wine. (I have been drinking pretty well, regardless… a lot more beer and liquors.) Mary Kate and I have been enjoying a box of Maipe Malbec recently. In fact, we’re on our second box. We saw the boxes at Total Wine, and as I’m a fan of Maipe we decided to pick some up for everyday consumption. Though not the most refined wine, it is delicious, easy to drink, and a wonderful value at around $25-$30 for three liters (FOUR BOTTLES!) of wine that stays fresh for weeks. I am also fortunate to be eating well despite my budgetary constraints. 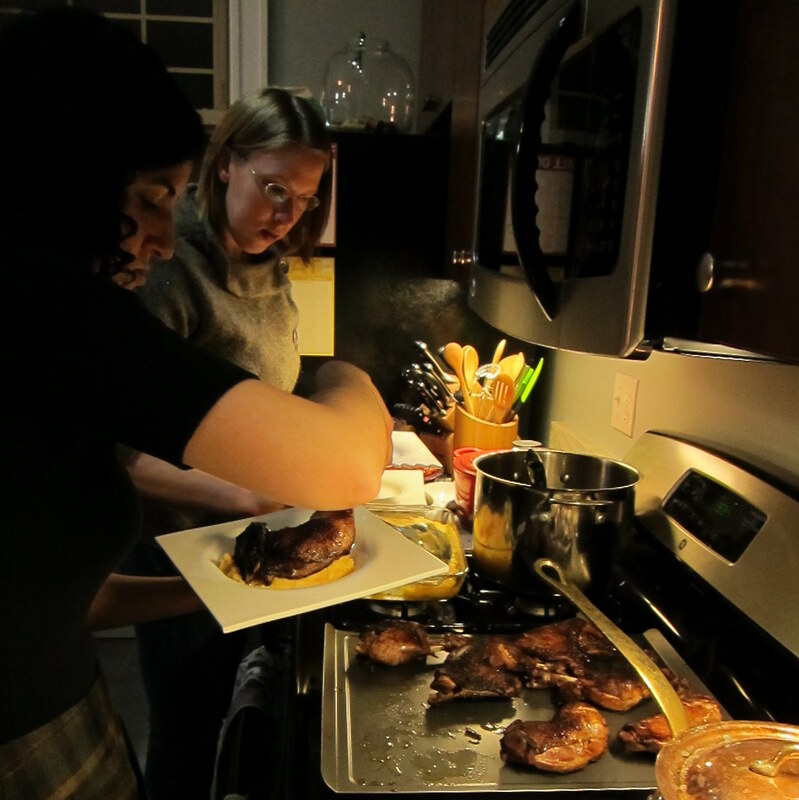 Mary Kate and I cook at home often, and we also eat take-out from delicious, high quality-to-price ratio restaurants like El Pollo Rico, El Charrito Caminante, Fast Gourmet, Iota, and Shake Shack. 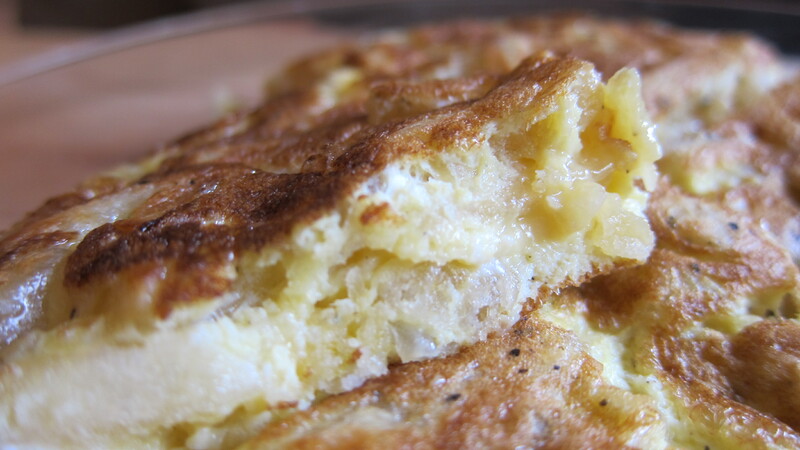 We usually find ourselves with leftovers, which are generally eaten as-is. 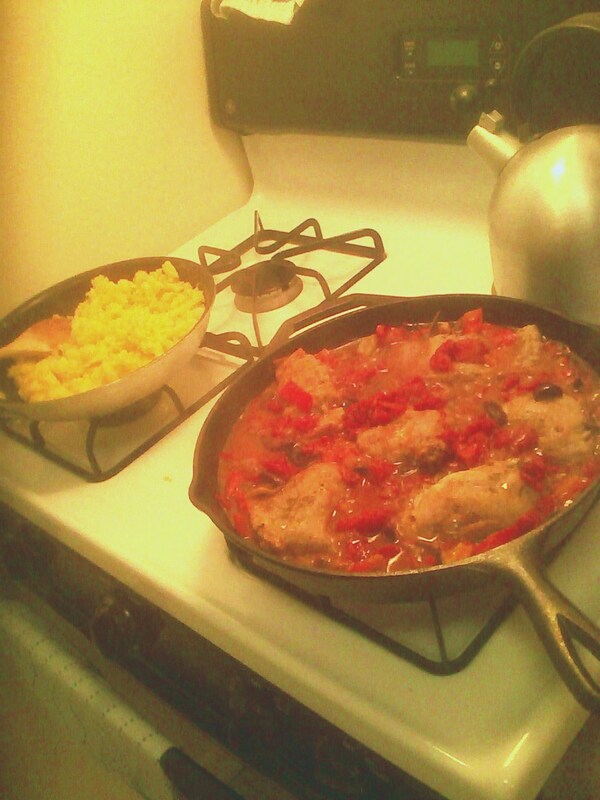 However, some leftovers need a bit more… finessing. For instance, it’s one thing to gnaw on a cold rack of pork ribs (Rhodeside Grill) or slurp down reheated Szechuan lo mein (Great Wall Szechuan House). What do you do with cold french fries? I have quite a few entries to post, including some from a very nice wine tasting trip up to Santa Barbara, but I will post this one first. 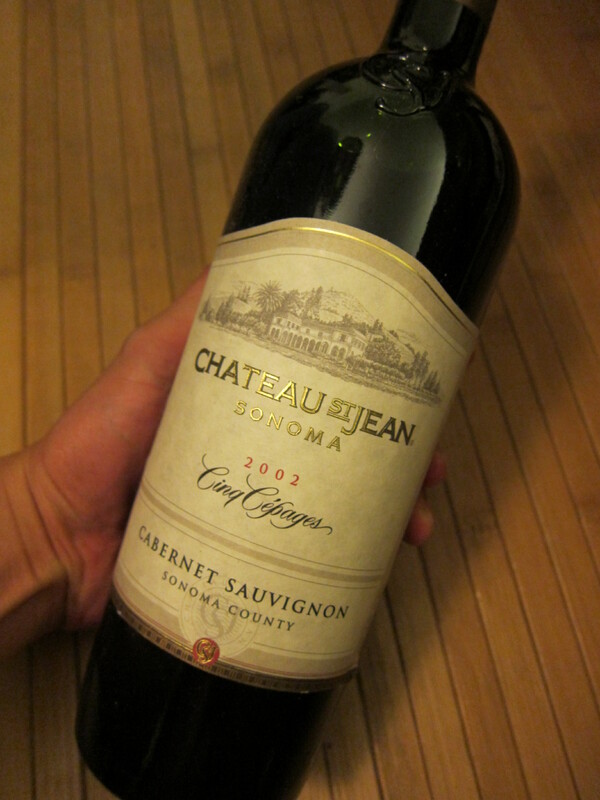 I had purchased a bottle of 2002 Chateau St. Jean “Cinq Cepages”, a wine composed of Cabernet Sauvignon, Cabernet Franc, Merlot, Malbec and Petit Verdot from Sonoma. While one could think of this as a meritage the people at CSJ classify it as a Cabernet because of the high percentage (at least 75% in any given vintage) of that grape in the blend. I was very excited about this wine, having had it shipped from invino to my home back in California. We opened it up yesterday for dinner, which was New York strip steaks topped with caramelized onion, creamy mashed potatoes, and a nice green bean, tomato, and feta cheese salad. True to form, I opened it up about an hour before dinner to drink while cooking. Very dark, saturated color. On the nose there was prune and blueberry, and herbs. When my mom tried it she said it tasted salty–I agree: there was sort of a cured olive aspect to the wine. 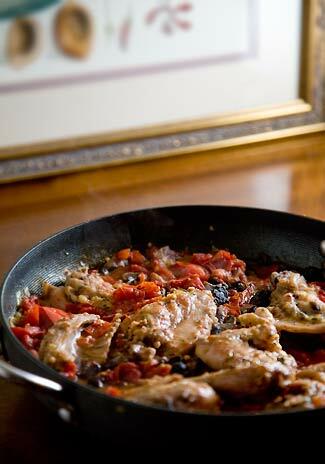 I got the prune and berries, along with tar, tobacco, licorice, and stone–nicely integrated, soft tannins. It had a long finish, resolving to lighter red fruit notes. What happens when you are part of a Wine Buyers Collective and a Wine Appreciation Society? A lot of wine to drink with a lot of people. 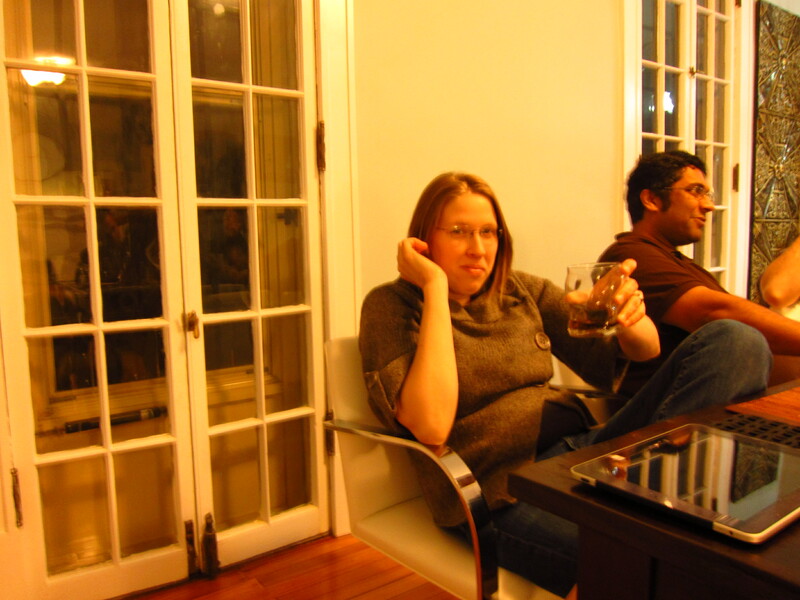 Kate and Rahul, who are esteemed members of both organizations, thus found themselves with about two cases of wine. They invited us over for dinner where they would provide the wine; Meredith, a trained chef, agreed to coordinate a dinner to go with the wine. 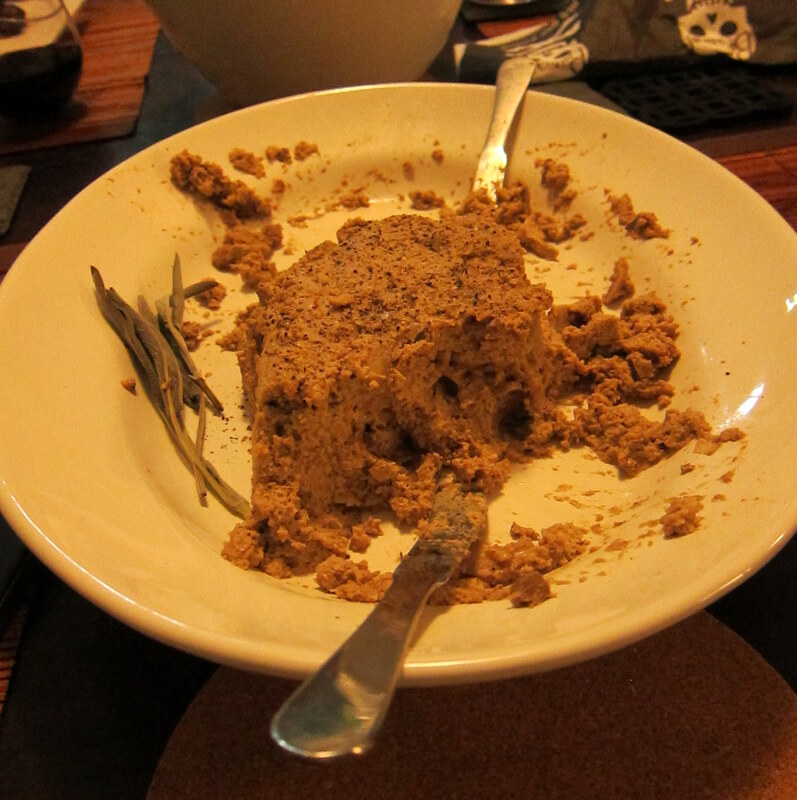 But the mushroom paté turned out surprisingly well; actually, all the food turned out extremely well. 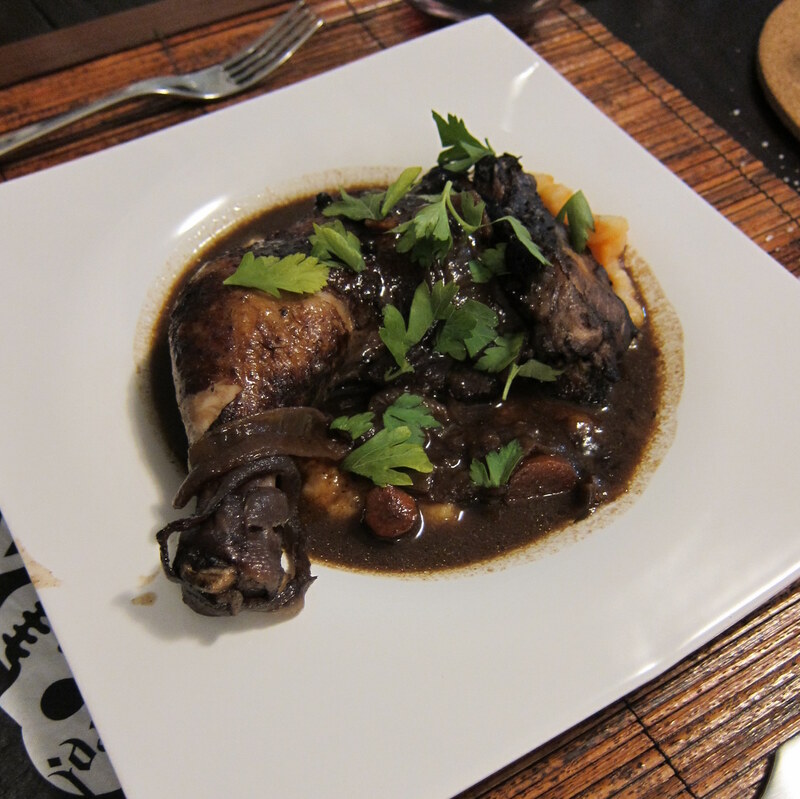 The coq au vin, made with love and care by Meredith, was supremely flavorful and tender, with some caramelized onion and carrot that hit me like sweet/umami bombs. The greens were a fine balance between bitter and buttery, and the quince tarte tatin was like something out of heaven. There is something therapeutic about seeing trees and towns and wide blue sky passing by you at 80 miles per hour as you sit in a car, listening to good music, on your way to somewhere. It is an added bonus when those trees are at that moment when they are still lush but where the leaves are no longer green but various hues of yellow, red, brown, and orange. Such were the trees on the road on the way to Lexington, North Carolina, whose Barbecue Festival my friend James (of The Eaten Path fame), our friend Nick (of the US Patent and Trademark Office) and I attended this past weekend. For those of you who do not know of James by this point, he is one of my good friends from Berkeley who has for the last year called Brooklyn, New York home. While his more regular contributions to the blogosphere can be seen on The Eaten Path, he also is a huge aficionado of all things barbecued, once spending a few weeks traveling through the Smoky Crescent and eating and observing the best the South had to offer. 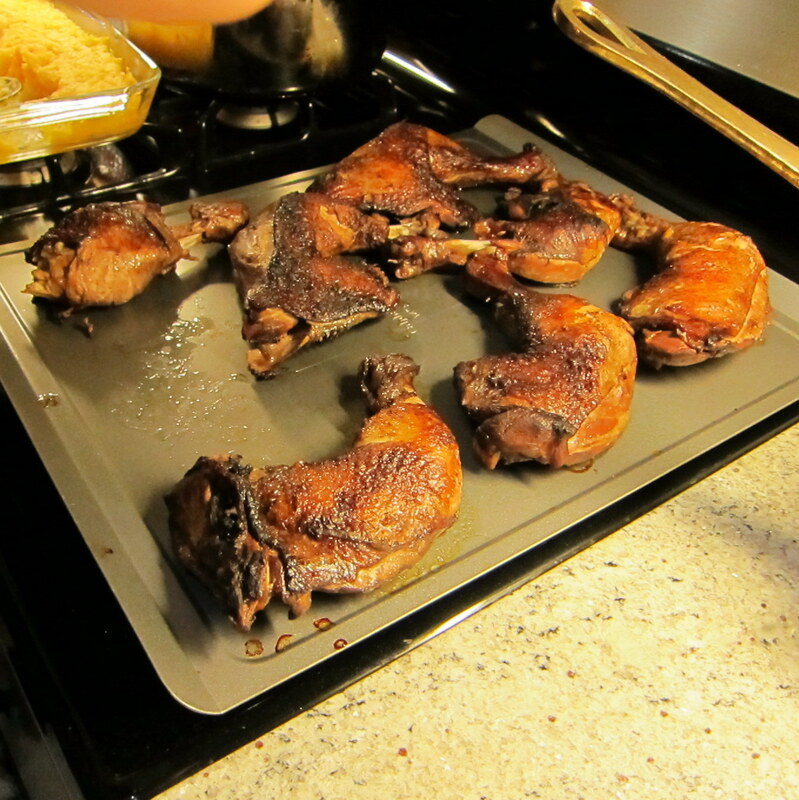 It is one of his goals to publish a comprehensive and awesome book on barbecue–a noble goal, indeed. Thus, when he said there was a barbecue festival in North Carolina I asked if I could go. I figured I wouldn’t have very many more chances to have a purpose to go to North Carolina, and besides, any reason to get out of DC is reason enough.